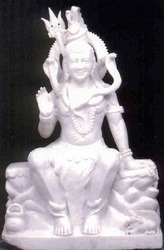 We specialize in offering our clients an exclusive range of Shiv Marble Statues. These statues are creatively designed as per the specific choice of valuable clients. Elegant designs and excellent finish of these statues easily attracts the eye of viewers’. One can avail Shiv Marble Statues in various sizes, designs, colors and patterns as per their specifications. Creative carving on these statues is done by expert craftsmen who provide realistic and unique look to these statues. Lord shiva is considered as the lord of power, destruction and provider of live to everything in the world. Lord shiva is being believed and worshiped by a much wider community across the country as well as in several other countries also and hence we have brought forth to our valued clients these top quality and finest grade white shiva statues. These White Shiva Statues have been manufactured using white marble which not only makes it shinning and attractive but also makes it efficient and reliable for long lasting lifetime. Looking for Shiv White Marble Statues ?